From one reporting document to strategic incident management? Read the case from CRH, leader in building materials. Many organisations do not learn sufficiently from mistakes that have been made and do not have adequate grip over quality and safety within their organisation. For example, some organisations do not spend enough time on incident management, have a lack of insight and overview, or do not have the right people for the job. A powerful incident management system, such as the Report & Analyse module, can help these organisations. Increase the willingness to report issues by using a simple and user-friendly reporting system. Incident registrations and the analysis of incidents provide the perfect opportunity for your organisation to learn and improve immediately. Learn from errors that have been made by using a strong incident analysis. Employees can submit reports anytime and anywhere. Whether they are using a mobile phone or a tablet; the system works just as easily. Keeping the threshold for reporting low ensures an increase in the number of reports. This ensures that your organisation can act immediately following the complaint, deviation or incident. Each report forms the starting signal for process improvement. And this enables organisations to implement targeted improvement measures. Having a structural emphasis on incident analyses also ensures employees become involved. Improvement management results in an improved overview and insight. The Report & Analyse reporting system will support the change management process in your organisation by providing insight into the nature and extent of various reports. A central dashboard offers a continuous overview of the incident registrations and displays real-time information about the progress of improvement measures. In addition, you can easily create powerful risk analyses per department, category or period. This allows you to learn from mistakes that have been made and enables you to change existing processes in order to prevent incidents in the future. Take the step towards complete incident management. We have over 20 years of experience in the field of incident management in various industries. This allows us to offer the best practices in a non-binding manner, so you can start immediately. Use this knowledge to accelerate your implementation project for process management. You can start working in a smarter and more efficient manner today. Do you have questions about the module Report & Analyse? Feel free to contact us! We are glad to help you. Simply record deviations, complaints, accidents or other events in an integrated system. Process the reports quickly and efficiently using a workflow. Notifications and complete report generation safeguards the process. Investigate the reports and convert the analysis to tangible actions to share and change knowledge, behaviour or skills. Secure improvements to avoid repetition. Smart reports offer an up-to-date and complete overview. Want to know more about Report & Analyse? Curious about how you can make your employees enthusiastic to use our Report & analyse software? Download our brochure. 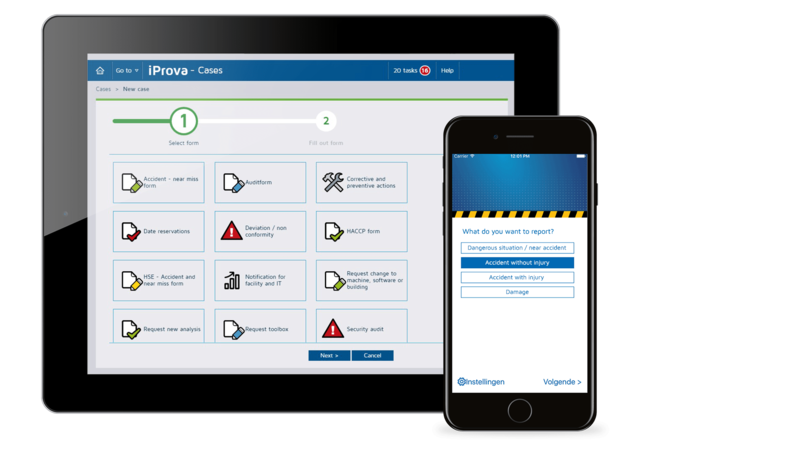 Employees at Libbey can now report faster thanks to smart software. Watch the video and find out how! Would you like an online or live demo? Increase the willingness to report within your organization thanks to a low-threshold and user-friendly reporting system. The iProva Capture app is an application that makes it possible to report everywhere and anywhere. The app is very user friendly. In addition, anyone with a Report & Analyse licence has free and unlimited access to the app. Are you interested or would you like more information about the iProva Capture app? Please contact our sales department.